That looks fairly mundane at first glance. Often apps present you with information before taking you to wherever you were going. 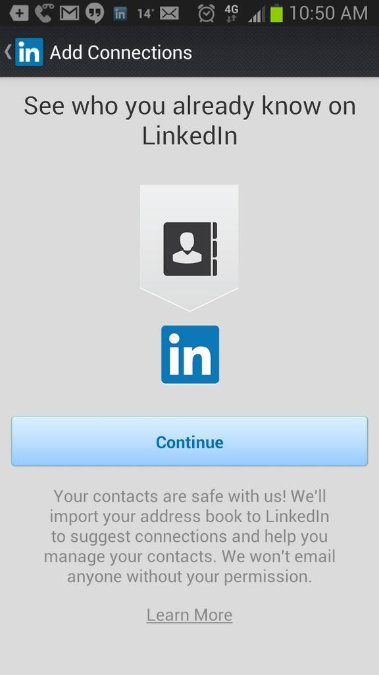 But… if you click ‘Continue’ there, you’re actually saying “I agree to LinkedIn importing my phone address book, and storing all of those personally identifiable details within their database”. This appears when you click on a notification from your phone (eg. someone new connecting to you). In that context, ‘Continue’ feels like it means ‘Continue on to where we were taking you’; not ‘Continue importing the details of all of my friends/family/colleagues’. There is no ‘skip this’ option at all. Your 2 choices are ‘Continue’ (presented in high-contrast) or ‘Learn More’ (presented in grey-on-grey text). I think: it feels like this has been done with the intent of getting people to click ‘Continue’ without realising what they’re doing, or because it appears to be their only real choice. The Daily Mail are testing an update to their Comment UX. It’s easy to ignore comments, and their usefulness, but take a look at a few of the Daily Mail’s articles, count up the number of comments & the number or ratings on those comments, make an estimate as to what percentage of people bother to rate comments, and it very quickly dawns on you that they make hundreds of thousands of pounds for the Daily Mail every year. ie. They regularly get 2.5 million comment ratings in a day. Another way of looking at that: they’re close to a billion comment ratings per year. Therefore, whereas a change to comments style on most sites would be a trivial tweak, for the Daily Mail it can have a big effect. Inclusion of headshots where available. They now split out ‘positive’ & ‘negative’ comments, rather than just showing the aggregate. The text is much larger. Username leads now, and is clickable through to user’s profile. Times are relative to the current time, rather than being timestamps. The more prominent profile info, and the headshot are quite telling. I wonder if at some point they will do a bit more with profile pages themselves? There’s a big opportunity for newspaper sites to get ‘user generated’ news commentary right. Move the mouse over the comments & you get two new extras. Top right is a small down arrow that allows you to report abusive comments. Below the comment a block of prominent ‘share’ icons appear. The Daily Mail have an interesting issue in that their articles are hugely commented on, but surprisingly ‘undershared’. This may help address that a little. If you’ve never visited their stats page before, it’s very much worth a look: http://dailymail.co.uk/stats. If you were a sensible competitor, you’d have been following their stats for the last few months and would be able to see whether this UX update has increased/decreased the likelihood of users leaving and rating comments. This shows info ‘on load’ of pages, but it is broadly similar on this site when factoring in people who rotate the device after the page loaded. I’m about to roll this out for a couple of large sites, but thought I would share the stats before I do so. If you’d like any more info drop me a note! Responsive design is (as you probably know) where you design a website/pages in such a way that the content displays differently on different devices. Usually that means navigation/content is organised differently on phone vs desktop/laptop (and sometimes differently on tablets, and at other screen sizes). Old iPhone screens were 320 pixels wide by 480 pixels high (320×480). The Samsung Galaxy S3 has a screen resolution of 720×1280 pixels. In other words, only taking into account those 2 phones, if you’re designing a ‘mobile site’, you’re actually designing for 2 very, very different displays: One that displays 153,600 pixels, and one that displays 921,600 pixels (ie. 6 times as many pixels). As a result, there are many sites that were designed when 320×480 resolution phones were the norm, which now look very odd when viewed on newer phones. The new problem is very similar to the phone pixel problem, but across laptops. For the last few years, the majority of laptop sales have been among laptops with roughly similar screen resolutions., give or take 10-20%. Here are 2 mockups showing what a website will look like on a Macbook Air, and how it will look on the Google Chromebook Pixel. In other words, both laptops are (very roughly speaking) a similar size, but the content displayed on them will look utterly, radically different in scale. Samsung Galaxy S3: 720×1280 pixels. Current 11″ Macbook Air: 1366×768 pixels. Google Chromebook Pixel: 2560×1700 pixels. Add in tablets to this, and more forthcoming Apple Retina products, and it becomes very messy firstly to design across all of this, and perhaps more importantly to optimise for conversions/user experience.